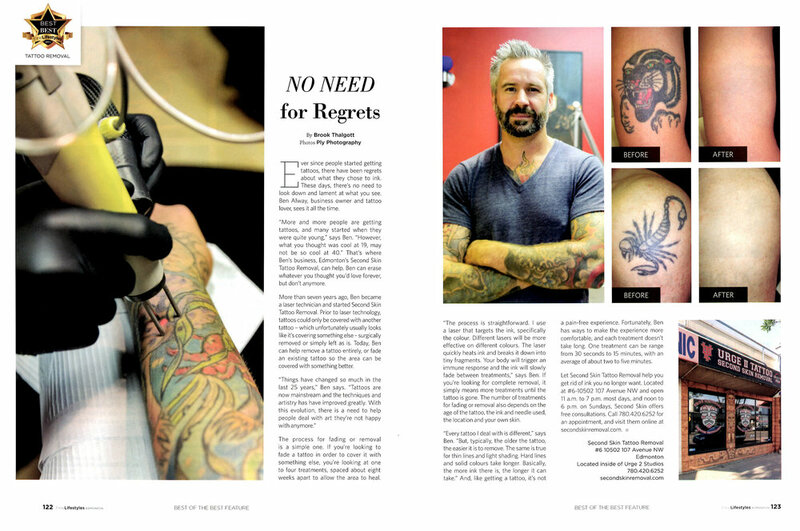 Ben Alway founded Second Skin in 2007, focusing on tattoo removal. We have since grown, moved into our own location, and have added more laser services in the last year. Ben & Madi are more than happy to help you out on your journey of tattoo removal, hair removal, facial rejuvenation, spider vein removal, sun damage or age spot removal, and scar reduction. Jen will take your call, book your appointments, and answer any questions you may have. Second Skin Laser is open 7 days a week. We recommend booking an appointment to make sure we can see you for a consultation or treatment, as we do book up quite quickly. ⚡ Ben works Monday, Tuesday, Friday afternoon, and every second Saturday. Ben was trained at The Rocky Mountain Laser College with the Laserman Lorenzo Kunze in 2007 and opened up Second Skin in Red Deer. Ben traveled back and forth between Edmonton and Red Deer before making the move to Edmonton full time to share a space with Urge 2 Tattoo. In 2018, Second Skin Laser expanded, adding another laser for new services, and moving to the location we are in now. Book with Ben for tattoo removal, hair removal, fractional facial rejuvenation, spider vein removal, scar reduction, and sun damage or age spot removal. ⚡ Madi works Wednesday, Thursday, Friday evening, every second Saturday and Sunday. Madi has been with Second Skin Laser since 2016. Madi has completed training with Lorenzo Kunze Jr. at International Laser Academy and a comprehensive apprenticeship with Ben. Book with Madi for your tattoo removal, hair removal, spider vein removal, laser genesis facial, carbon laser facial, scar reduction, and sun damage or age spot removal. ☎️ Jen works Monday to Friday, but we do have someone taking calls for appointments on the weekend as well. Jen has been with Second Skin Laser since 2014. Jen has completed training with Lorenzo Kunze Jr. at International Laser Academy and is qualified to answer any questions you may have.